Father-to-be, Joel, argues with mother-to-be, Bethany, about replacing Ol’ Blue, the Ford F-150 that was his father’s. Next morning, Joel drops Bethany off for her second visit with their midwife, and Joel lets the imps in back of his mind take over his commute. He drives off the road into a muddy pasture. Listening to one of the most amazing songs ever, Neil Young’s “I’m the Ocean” from his vastly overlooked Mirrorball album. Amazing raw imagery, soaring sound. I was somehow reminded of something I saw in a textbook once, in a class I took on Ancient Greek art and archaeology. 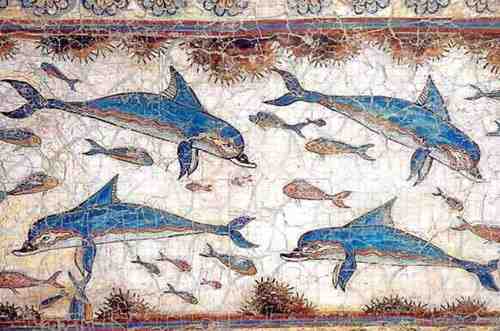 It was a fresco of dolphins at Knossos, the Minoan city (Crete). I was always struck by how accurate these ancient dolphins appeared to be. Here were all these Bronze Age faience sculptures of humans that lacked the verisimilitude of the high classical period, yet these dolphins were relatively faithful Technicolor reproductions. Enjoy. Next post:Hi, reader. Who are you?